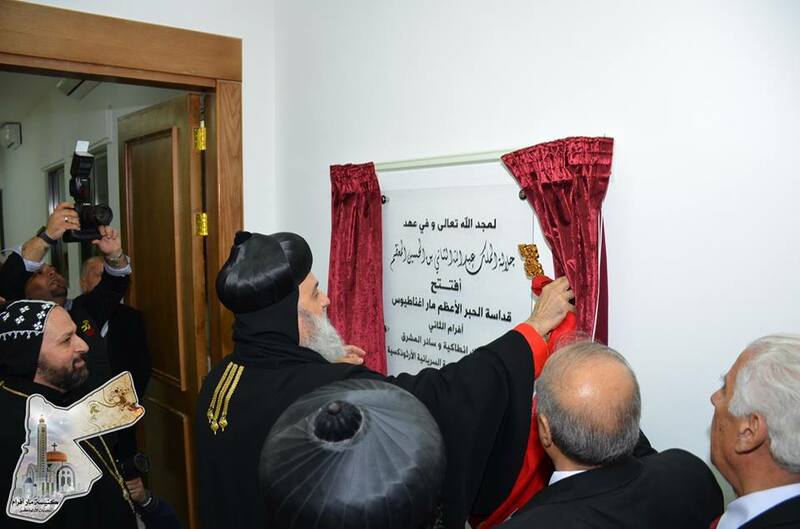 After the Holy Qurobo, His Holiness Patriarch Mor Ignatius Aphrem II inaugurated St. Mark Social Center in Al Swaifyeh, Jordan. First, His Holiness conducted a small prayer, then he took curtain off the inaugural plaque. Their Eminences Mor Severius Hawa, Archbishop of Baghdad and Basra, Mor Athanasius Touma Dakama, Patriarchal Vicar in the United Kingdom, and Mor Timotheos Matta Al-Khoury, Patriarchal Vicar in the Patriarchal Archdiocese of Damascus, as well as representatives of the various churches in Jordan, and a large crowd of the Syriac Orthodox faithful, were also present. At the end, His Holiness met the faithful at the large hall at the Center, and gave them his Apostolic benedictions.